“The first virus in this group was discovered in 1972 following a disease outbreak at a school in Norwalk, Ohio in 1968. Since then research has been underway to culture noroviruses in the laboratory and develop animal models,” says lead researcher Christiane Wobus, Ph.D., assistant professor in the Department of Microbiology and Immunology at the University of Michigan Medical School. The new model was developed by determining whether human noroviruses can infect “humanized” mice, this is mice containing human immune cells. These mice are widely used for study of the human immunodeficiency virus (HIV), a virus which can only infect human cells. “Most people can cope with the symptoms, but deaths are more likely among the elderly mainly because of dehydration,” Wobus says. 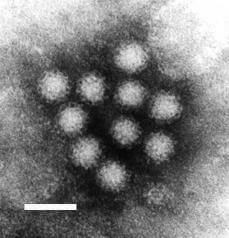 The economic impact of these infections is staggering with an economic cost for norovirus associated food-borne outbreaks alone of $5.8 billion in the U.S.
Additional authors: Taube, S.*, Kolawole, A.O. *, Höhne, M., Wilkinson, J.E., Handley, S.A., Perry, J.W., Thackray, LB., Akkina, R. *Both authors contributed equally. Reference: “A Mouse Model for Human Norovirus,” mBIO 4:e00450-13. Funding: National Institutes of Health grants AI080611; AI073255; AI0544483, U54 AI057160 and AI084887.